The vitamin B6 also called pyridoxine is needed in the diet in trace amounts. This vitamin functions as an essential and important co-enzyme in many of the vital biochemical reactions that involve the amino acids - thus making it vital for proper protein synthesis as all proteins are synthesized from amino acids. When proteins are eaten, they are broken down into their constituent amino acids, which in turn must themselves be degraded as a part of normal digestion, they are then absorbed and after inter conversion they are slowly taken up by the cells in the body to form individual protein molecules. The presence of the vitamin pyridoxine is essential for the occurrence of all of these chemical changes. A good example of how pyridoxine plays a role is in the biochemical conversion of the amino acid tryptophan to the vitamin niacin - this chemical conversion cannot happen without the presence of the vitamin. A vital biochemical role is also played by the vitamin pyridoxine as far as the body's metabolism of dietary fats and carbohydrates is concerned. Pyridoxine is also required for the synthesis of unsaturated fatty acids consumed in the diet. 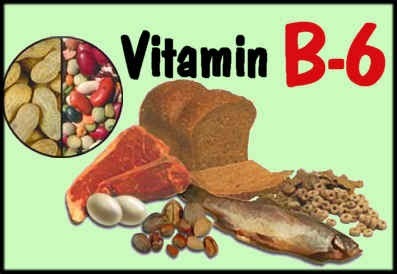 Enough metabolic energy for the cells cannot be generated without the presence of vitamin B6 in the body. The formation of the fibrous protein collagen is influenced by the vitamin pyridoxine. This particular role of the vitamin in collagen formation in the body may have implications for the treatment of heart disease, as many doctors believe that causative defect in case of heart disease lies in the structure of the arteries and the weakening of the integrity of the vessels - this according to them prepares the blood vessels for gradual deposition of fats and minerals in the arterial walls. The causative factor of this initial lesion is attributed by some clinical researchers to a deficiency of pyridoxine during pregnancy and they aver further that the generally poor quality and low nutritional value of the foods eaten in the average American diet prolongs the deficiency and is a factor to the eventual development of heart disease. Sufficient evidence exists about the effects of maternal pyridoxine deficiency, at the same time such a deficiency is believed to be significant that the theory must be taken seriously. Sufficient evidence also exists about the role of pyridoxine in the development of cancer. A biochemical evidence for an increased requirement for this vitamin in women suffering from an advanced stage of breast cancer and other types of cancers - in these patients, suffering from cancer induces a deficiency of the vitamin. There is still a shortfall in the levels of pyridoxine in these women, even when dietary pyridoxine doses were large enough for the maintenance of adequate concentrations of the vitamin in the body. What this evidence points out is that pyridoxine is somehow being "used up" by the body in a biochemical defense against the developing cancer; another possibility is that cancerous tissues may simply be interfering with the metabolism of pyridoxine in the body leading to a state of deficiency. Biochemical signs of a pyridoxine deficiency start to normalize in individuals suffering from Hodgkin's disease, as soon as the disease goes into remission. What is of great interest, is whether using supplements of pyridoxine can bring any effect on the progression of the disease - this hypothetical question is currently being tested in trials using human test subjects. The rate of recurrence of bladder tumors was found to be slightly reduced during one study, through the supplemental use of relatively low dosages - about 25 mg of pyridoxine. Compared to conventional anti-cancer medications found in the market, the supplements of pyridoxine was found to have significantly stronger preventive action in this study if the count of people who did not experience recurrences of bladder cancer during the first ten months of the study were removed from the calculations. One theory posited by doctors is the longer time pyridoxine takes to start effecting changes in the tissues. This assumption can be called a reasonable one only if pyridoxine actually strengthened the body's immune system functioning and boosted its performance. All women who use oral contraceptives must take extra care about the level of pyridoxine they are getting from the diet, all such women including all pregnant women have to check with a doctor regularly about receiving adequate amounts of the vitamin in the diet, this may not be possible without the long term use of pyridoxine supplements. Many doctors also normally advise pregnant women to use combined vitamin mineral supplements so as to avoid the risk of a deficiency which may hold harmful consequences for the developing fetus. While the symptoms of a pyridoxine deficiency are quite obvious enough to serve as a warning to the affected woman, such deficiencies have a tendency to pass unnoticed till the full consequences and symptoms sneak up on the person and it becomes too late to rectify the damage. A single study found that the levels of vitamins in the body of pregnant women went lower the further the pregnancy progressed, this study was meant to measure the levels of pyridoxine present in the bodies of otherwise healthy pregnant women. The period of most intense fetal growth was when the most rapid decline in levels of total vitamins in the body of the women took place as per the results of the clinical study. The birth weight of babies also went higher the higher the mother's pyridoxine levels just previous to conception and during pregnancy according to the results obtained by the clinical scientists. Pregnant women do not require mega doses of pyridoxine to maintain the concentrations of pyridoxine in the body at an adequate level. The levels of pyridoxine according in pregnant women could be kept high by supplements of 10 mg pyridoxine daily during the entire term of pregnancy. Women who took pyridoxine supplements at this dosage amount also gave birth to babies who had high levels of the vitamin in the cord blood. 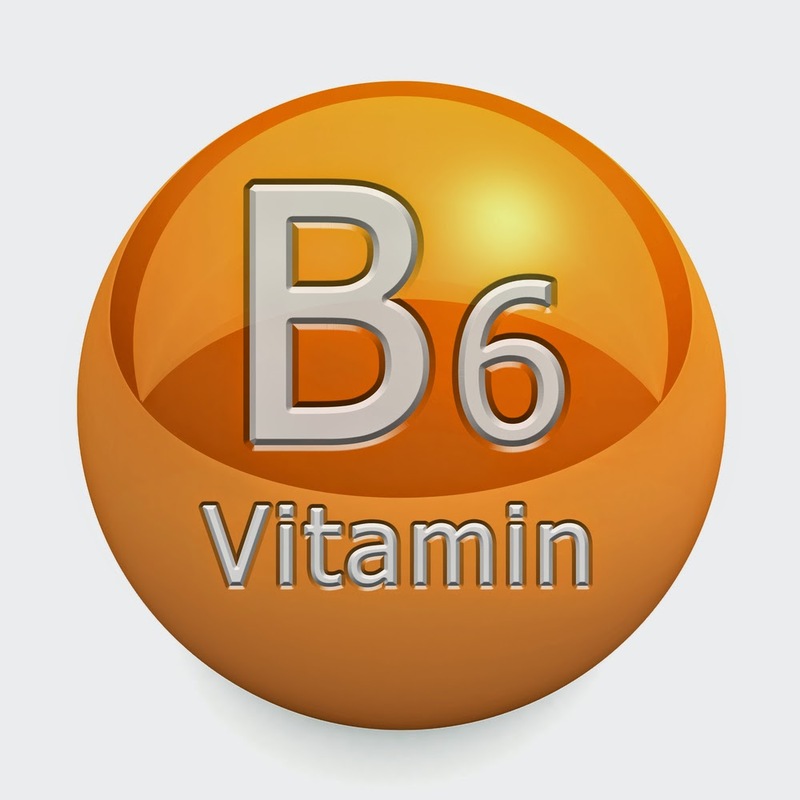 The majority of foods contain vitamin B6. Deficiencies are rare, but may occur if the individual has poor intestine absorption or is taking estrogens, corticosteroids, anticonvulsants and some other medications. Long-term alcoholism may also result in eventual B6 deficiency, as can hyperthyroidism and diabetes. The nervous system is usually among the first areas in the human body to suffer the symptomatic effects of a pyridoxine deficiency. Animals and developing children are usually affected in a much more pronounced and lingering fashion than are others in cases of pyridoxine deficiency. If they persist, the convulsions seen in infants fed pyridoxine free formula in years past would have eventually progressed to symptoms including permanent mental retardation or even death. In a body affected by a pyridoxine deficiency, the protein supply to the brain is sharply cut off though the brain needs a lot of proteins for its proper development and normal functioning. The brain is not the only organ affected by a deficiency of pyridoxine. A deficiency will interfere and disrupt the entire development processes of the organism, affecting all organ systems in the body. For example, in animal tests where animals are placed on diets having varying doses of pyridoxine during pregnancy, the offspring born to animals that suffered a deficiency were generally small in size, were sickly and had an impaired development of the nervous motor system. High doses seem to be of significance as pregnant animals which were fed diets amounting to four times the "standard" or "adequate" levels of the vitamin pyridoxine gave birth to offspring that were on the whole far healthier and fully developed compared to the offspring of animals fed the standard doses of the vitamin. In general, high doses of the vitamin given to pregnant animals seem to benefit the offspring and generated no side effects in the progeny. The immune response in the human body is severely impaired by a pyridoxine deficiency and low levels of the vitamin at any one time can have drastic consequences for immunity. If the deficiency is apparent during a term of pregnancy, it can lead to a reduction in the size of the thymus gland, a vital gland that is important to the generation and regulation of the human immune response. This reduction of the gland is apparent in both the mother and the developing fetus. The capacity of the newborn baby to fend off disease is also impaired by the presence of a deficiency of pyridoxine just prior to a term of pregnancy. The functioning of the liver is also impaired by a deficiency of pyridoxine, at the same time the liver can be permanently damaged by prolonged pyridoxine deficiency. A deficiency of pyridoxine also results in the elevation of the total blood levels of cholesterol, it is not clear if this is due to the role played by pyridoxine in the functioning of the liver or because of its role in the metabolism of fats - both factors may be involved in this regard. As seen in animal tests, all the animals that were kept on a state of pyridoxine deficiency and given just one percent of their diet in terms of contained cholesterol still accumulated above normal levels of cholesterol in the blood. The development of arteriosclerosis was also apparent in all the test animals that were kept on a pyridoxine deficient diet for long periods of time. Pyridoxine deficiency is characterized by some standard physical symptoms that are easy to recognize. These include the development of a greasy and scaling dermatitis in the skin around the eyes and the ears, as well as the nose and the mouth, this condition is also apparent in all the areas of the body that are frequently rubbed together, like the skin around the inner thighs. Other probable physical symptoms of a pyridoxine deficiency include heavy inflammation around the oral region, this symptoms is similar to what is seen during a deficiency of the other B vitamins. Symptoms such as severe neuromuscular problems like convulsions, as well as general nerve tissue degeneration may also affect adults and children suffering from a pyridoxine deficiency. Pyridoxine is required by some people in greater amounts than others, such individuals may be born with this greatly increased requirement or dependency on high levels of pyridoxine - the cause of this need for high amounts of the vitamin may be genetic in such individuals. Among these genetically pre-disposed people, a fortunate few may be saved from developing mental retardation by being identified early enough for lifelong supplementation of the vitamin. A pyridoxine deficiency is quite obviously not the reason for all mental retardation that affects people - mental retardation has many biochemical, social, psychological and physiological causes. Animals that have a pyridoxine deficiency often develop arteriosclerosis essentially identical to the form in which it occurs in human beings. One must include a word of caution here, so that this vitamin is not thought of as being a panacea or a totally useless trace nutrient - pyridoxine is not the most important nutrient, but it can be said to be vital to some very important biochemical processes in the human body. The statement that pyridoxine deficiency causes heart disease will not be made by any responsible physician or nutritionist at any time, since it is simply not true to say so. The fact is that a lot of evidence points to the high fat and sugar diets and the essentially sedentary but competitive lifestyle of modern humans are the primary factors in the causation of heart disease. However, the involvement of pyridoxine in the prevention of heart disease is supported by some evidence and just supplying adequate doses of the vitamin to a person may really help in the prevention and treatment of heart disease. The assumption that taking vitamin supplements will lead to the avoidance of heart disease is simply untrue as a lot of factors are involved in causing heart disease. These sorts of simple minded assumptions about diseases and their causes can be dangerous. 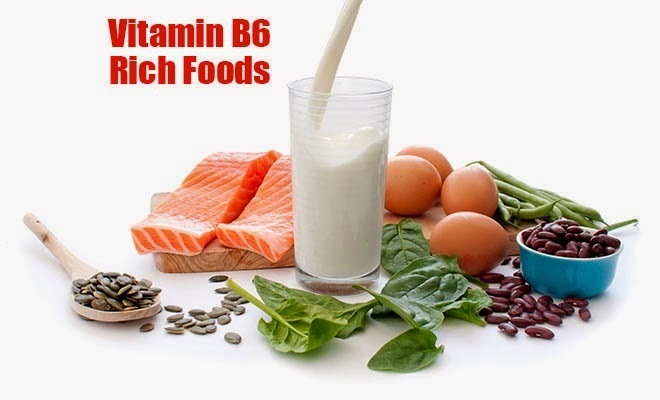 Most foods have some vitamin B6, and a well-balanced diet should not result in deficiency, unless the individual has a physical problem or is on certain medications. Some of the natural food sources that are rich in pyridoxine content include organ meats like the liver, all whole grain cereals, yeast and wheat germ, soybeans and peanuts, blackstrap molasses and corn. Pyridoxine is also found in good quantities in some types of fruits and vegetables, these include vegetables like cabbage, fruits like bananas, tuberous plants like potatoes, fruits like avocadoes, as well as peas and green peppers. Significant quantities of pyridoxine present in raw foods is degraded and destroyed by the processing and canning of foods, this is due to the fact that pyridoxine is both sensitive to light and soluble in water. To gain maximum benefits from the vegetable sources of the vitamin, the vegetables can be eaten raw or in a semi-cooked state. Some pyridoxine may also be excreted out of the body due to the presence of wheat bran, which may "soak up" some of the pyridoxine and cause it to be passed out in the stool. People who consume large quantities of wheat bran as a part of the daily diet must ensure that they get enough pyridoxine in the form of supplements, such doses of the vitamin must also preferably be taken at meal times other than those during which wheat bran is being consumed. While all meats in general are considered to be some of the best sources for the vitamin pyridoxine, a careful clinical study of the relative levels of pyridoxine in vegans - individuals who do not consume any kind of animal products including dairy - and individuals who ate meat discovered no significant or observable differences in the levels of pyridoxine between these two groups of people. A wide range of supplemental doses of the vitamin pyridoxine are available in the market, some of these range from 5 mg to tablets that are more than 500 mg each. Pyridoxine (vitamin B6) is possibly safe when taken by mouth in amounts greater than the recommended dietary allowance. In some people, pyridoxine might cause nausea, vomiting, stomach pain, loss of appetite, headache, tingling, sleepiness, and other side effects. While adverse effects from supplemental use of vitamin B6 are uncommon, such side effects can be severe when the vitamin is taken at high dosage levels - exceeding 200 mg or more per dose daily. In such cases, the vitamin can damage the functioning of the sensory nerves; it can induce numbness in the hands and feet and cause difficulty in walking or movement. If any of these symptoms start to develop, it is advisable to immediately halt all further vitamin B6 supplements and consult a doctor. Dosage levels in excess of 100 mg of the vitamin must never be used by pregnant women or nursing mothers. As far as other healthy adults are concerned, supplemental amounts of 200 mg to 300 mg pyridoxine daily can be considered safe. Though there are rare cases of symptomatic problems reported even in this supplemental range. A nutritionally oriented doctor must be consulted by any healthy adult who plans to take more than 100 mg to 200 mg of the vitamin B6 for periods longer than a few months. The dosage amount of the vitamin B6 supplement determines the nature and type of side effect seen in the individual using the vitamin. However, as a rule of thumb, everyone is advised to taken no more than 500 mg of the vitamin daily, even if this is to be carried out under medical supervision.